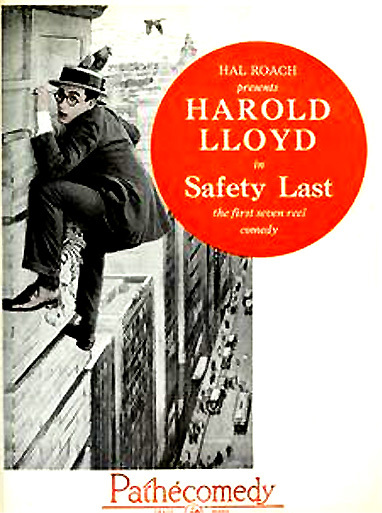 Safety Last (1923) earned Harold Lloyd, the bookish, horn-rimmed glasses, straw-hat-wearing comedian and Everyman hero, his nickname "the King of Daredevil Comedy." Lloyd's films of this period often included timeless gags, pathos, and clever visual elements. The film was directed by Fred C. Newmeyer and Sam Taylor, and produced by Hal Roach. Other Lloyd films that featured the same character included Girl Shy (1924), The Freshman (1925) - his most successful film, For Heaven's Sake (1926), and The Kid Brother (1927) - often considered his best film. This successful film is most remembered for its thrilling, hair-raising climax - a reckless, 'safety last,' humorous stunt in which Lloyd hangs off a clock on the side of a twelve-story skyscraper above busy Los Angeles streets. The scary sequence was deliberately shot with most of the camera compositions including views of the perilous drop behind him. It was all the more remarkable, because Lloyd had the use of only one gloved hand (in 1919, a prop bomb exploded in his right hand, causing him to lose the thumb and one finger). The naive Boy (Harold Lloyd) travels on a train to the big city from the small town Great Bend, promising to send for his Girl (Mildred Davis, Lloyd's real-life wife - this was the last time he worked with her as his leading lady in a film) after he has 'made good' with fame and fortune. In the opening sequence, he appears behind vertical bars - presumably imprisoning jail bars, but they are actually the train station's gate. Wanting to appear as a success to her, he knows that he must make money quickly. Offered $1,000 by the store's manager if he devises a successful publicity ('exploitation') gimmick to attract crowds of people to the store, he hires his roommate and construction worker friend the Pal (Bill Strother, with a real "human fly" act) to be a human fly on the outside of the multi-story store in a thrilling stunt, as a publicity stunt for the department store. Their plan is to split the cash after the friend performs the stunt. Unfortunately, as things turn out, the Boy must climb the first floor while his pal eludes and ditches a pursuing cop - the Law (Noah Young). He is dismayed when at every level his buddy is diverted and he cannot be replaced. On each new floor, the Boy is coaxed to go one floor higher. The most-remembered obstacle is the clock. For thrilling moments, he hangs from the minute-hand of the large clock, dangling dangerously above the street as the clock-face pulls off the wall - while still wearing his glasses and straw hat. It is one of the most famous cinematic images of all time. He finally reaches the top of the building, lands in the girl's arms on the roof, and they go off arm in arm. Our hero has proved his worth, become a success, earned the $1,000 prize money, and won the girl. Unbeknownst to the Boy, he tromps through fresh tar on the roof of the building, leaving - in four steps - his shoes and socks behind.